Red Lipsticks are confidence boosters. That I believe. But some go as far as to say that women who wear red lipsticks have better careers and success. Really?! I don't think so. I'm somebody who used to have a red wallet because according to Feng Shui, red wallets attract money. I was in college and always broke, so I thought it was the best piece of information I'd ever heard and I believed in it until...I couldn't afford a bread pakora from the college canteen. Of course I didn't have enough money to begin with and I always had expensive taste, but still. Colorbar Velvet Matte Hot Hot Hot ~ So HOT! Revlon Colorburst True Red ~ Really a true red. Finish is awesome, but I don't like how wide the tip is. Not very easy to apply with. MAC Heartless (Venomous Villains Evil Queen) ~ I'm so glad I got this. It's superfabulous! Swatch below. Shu Uemura RD 165S ~ This has silver shimmer, and I heart it coz it makes my teeth look really white. MAC Viva Glam Cyndi Lauper ~ I realized this isn't really red, but it belongs in the family. Those are my favorite red lippies. 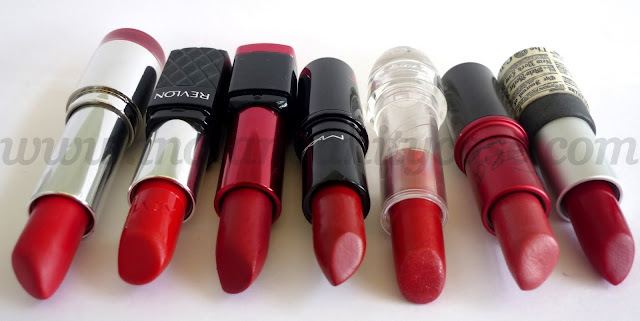 Next on my wishlist are MAC Russian Red or Ruby Woo. For years I've been swatching them in stores, but I just can't decide which one to get. I also like Maybelline Color Sensational in Fatal Red & Very Cherry. 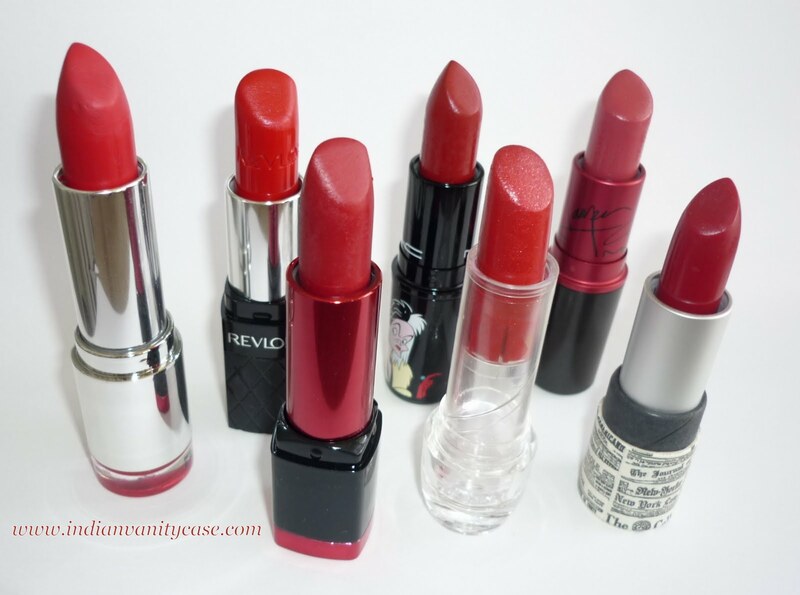 Which are your favorite red lipsticks? Do share. Gorgeous collection Cynthia! I have Revlon colorburst Crimson and I love it. It is quite cool toned and I'm looking for a hot warm based red. Which one would you recommend? 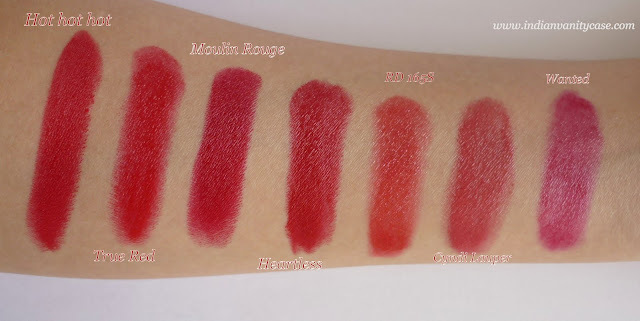 Based on swatches Colorbar HOT HOT HOT and Revlon CB True red seem like good options. Woww you've a gorgeous collection of red lippies...I don't have many of red but my favorite is Mac Russian Red!! That revlon one looks beautttiful! My favourite was my red chanel but it needs replacing now :( which breaks my little heart ha-ha. Lovely post! Heartless looks stunning. Great picks! I am wAAAAAAAAy too young to carry off red..so i just keep on with my favorite pinks,peaches and nudes...!! Can You Please please do a post about your Fav pinks AND Peaches??!! I like the Mac red lipstick the most. Great blog with lots of information that I need. Wow u look great in "heartless"
heartless looks awesome on u !! m yet to try a red..liked colorbar..n revlon true red is cool toned na..? 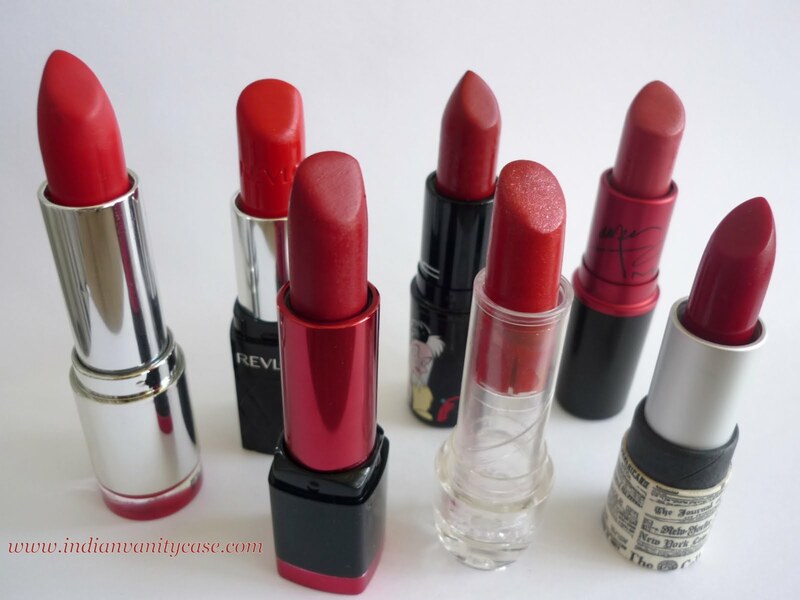 Did u like revlon crimson..I get confused between crimson n true red..wud check out maybelline too..fatal red is liked by many.. I have Ruby Woo and while I like the colour, it drains all moisture from my lips, so you need to have a really good lipbalm on underneath. There's a red by a company called Vasanti here in Canada called USA. It's a gorgeous matte red that's on my wish list, I hear that it doesn't dry out your lips either. Check it out: www.vasanti.com. 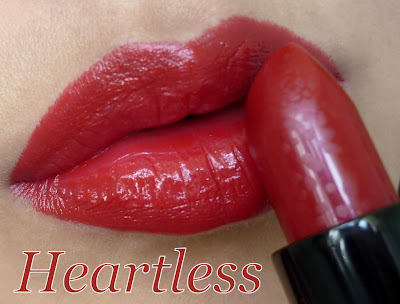 Heartless is one of my FAVORITE red lipsticks! I love Dior 999 - I'm Indian too with a similar skin colour to yours, and it looks great on me; you should try it! Hi Cynthia!!! I LOVE your blog, and especially this post. I spent the last few months trying soo hard to find the perfect red! I also really like MAC Viva Glam I! The MAC lady described it as a darker, more wearable version of Russian Red, which is true!